What a beautiful day in Atlanta the sun is out, flowers are in bloom.. but it’s even better when Julie Mussafer (owner of Jules Place) arrives on your doorstep! Julie often called (Jules) has represented my work for 10 years now and I have to say she is one of the the most talented and out going gallerist I have had the pleasure to work with. She has amazing eye for great work and knows when she see’s talent. Her whole staff in fact are welcoming, and helpful with their clients and artist. Jules Place has an incredible rooster of artist and I must say I have I have bought a handful of paintings from her gallery we have enjoyed for years. We had a lovely discussion about art today she saw my studio for the first time which was great fun. She looked at some new paintings I have been working on. 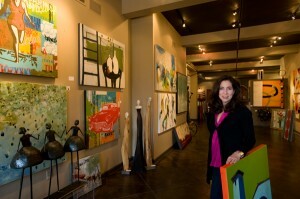 We discussed the the popularity of of textural, layered work.. it was all so exciting to visit with her. She is so knowledgable about the art world today and I was delighted to sit down and chat and listen to what she had to say. It was a lovely visit and I was so inspired by her when she left I went straight back to the studio to paint. I have also delivered new work to the gallery this past week “Stripes and Roses” and “Golden Pitcher”. I’m really quite excited about these, I love the playfulness, colors and layered detail in both these works.